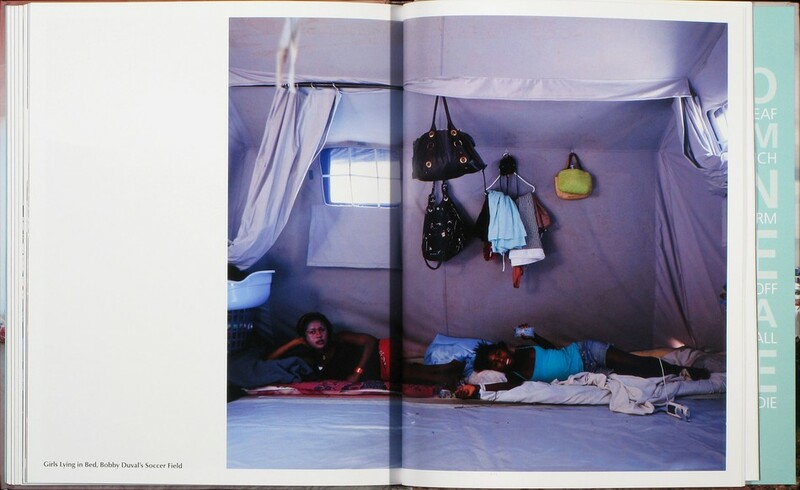 Recently, I have noticed an abundance of documentary photobooks published where once the books are sold, the proceeds are donated to a charity related to the photographic project. Over the next few weeks, I will focus on a few of these titles benefiting charities in locations such as Congo, Russia, United States, Japan and Cambodia among other locations and philanthropic causes such as hospice care, reconstruction after a natural or man-made disaster and the building of and funding for children's hospitals. 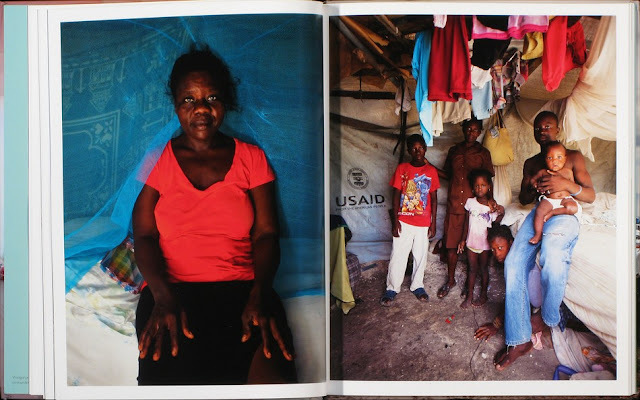 For the first installment in this series, I am featuring Wyatt Gallery's Tent Life: Haiti. In March 2010, Wyatt Gallery and six other artists formed the Le Sét Collective and traveled to Port-Au-Prince, Haiti, to volunteer with Healing Haiti and document the widespread devastation. The artists were amazed to discover an intense sense of hope and resilience, and, at times, joy among the people of Haiti. 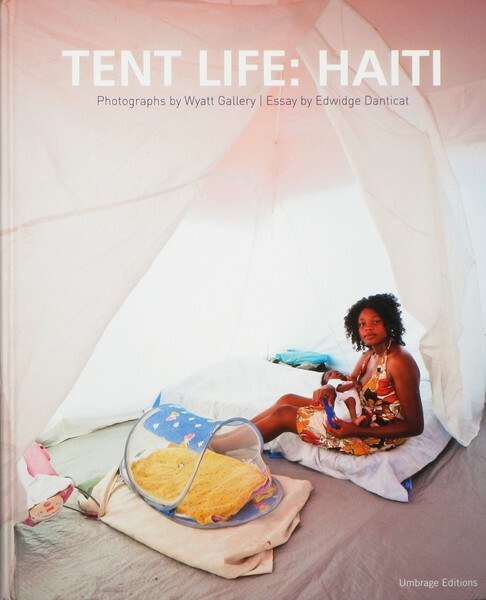 On September 20, 2010, Gallery returned to Haiti to continue photographing the massive tent cities that had emerged, creating the project and book Tent Life: Haiti to share his experience and help raise awareness and funding. Gallery is no stranger to natural disasters as he took on the task of documenting the tsunami in Sri Lanka in 2004 and the aftermath of Hurricane Katrina in 2005. His first trade edition book Tent Life:Haiti begins with a introduction by Gallery; essay by Edwidge Danticat (former Port-au-Prince native and writer of the acclaimed Breath, Eyes, Memory); a resource guide to some relief organizations working in this area; a reading list for information on this part of the island and a brief history dating back to the landing of Columbus on Hispaniola in 1492 to January 2010 when the 7.0 magnitude earthquake rocked the country killing over 200,000 and displacing thousands to the makeshift refugee camps. The book has paper-wrapped boards, printed endpapers and over 60 four-color illustrations including many full page bleeds of the cityscape. The photographer's focus of the project and the book are primarily the portraits of the inhabitants of post-earthquake communities and their new tent "homes" which are set up in many locations around the country. As of today, many still reside in what was supposed to be temporary housing and, according to a Huffington Post piece published early in 2011, many still want for "basic services like healthcare, clean water, toilets, sanitation." There is an ongoing need for support and 100% of the book’s royalties go towards three organizations actively working in this country: J/P Haitian Relief Organization, Healing Haiti, and the Global Syndicate. Signed copies arriving in about 2-4 weeks. Purchase a copy of Tent Life here or follow the links included and donate to the charity of your choice. For more information on a charity's rating, visit Charity Watch or Charity Navigator.